This article is about the native American people. For the African people, see Mono people (Congo). For the Mono Lake Paiute, see Kucadikadi. The Mono /ˈmoʊnoʊ/ are a Native American people who traditionally live in the central Sierra Nevada, the Eastern Sierra (generally south of Bridgeport), the Mono Basin, and adjacent areas of the Great Basin. Throughout recorded history, the Mono have also been known as "Mona," "Monache," or "Northfork Mono," as labeled by E.W. Gifford, an ethnographer studying people in the vicinity of the San Joaquin River in the 1910s. The tribe's western neighbors, the Yokuts, called them monachie meaning "fly people" because fly larvae was their chief food staple and trading article. That led to the name Mono. The Mono referred to themselves as Nyyhmy in the Mono language; a full blooded Mono person was called cawu h nyyhmy. 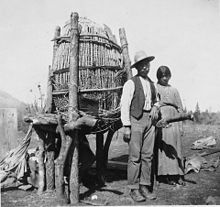 Mono Indians stand beside their Acorn cache in Fresno County, California, ca. 1920. Mono Indians used Acorns for their bread and families typically have 8 or 9 baskets of this size with acorns. 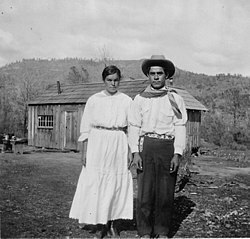 Today, many of the tribal citizens and descendents of the Mono tribe inhabit the town of North Fork (thus the label "Northfork Mono") in Madera County. People of the Mono tribe are also spread across California in: the Owens River Valley; the San Joaquin Valley and foothills areas, especially Fresno County; and in the San Francisco Bay Area. The two clans of the North Fork Mono Tribe are represented by the golden eagle and the coyote. Mono traditions still in practice today include fishing, hunting, acorn gathering, cooking, healing, basket making, and games. The Honorable Ron Goode is the Tribal Chairman for the North Fork Mono Tribe, which is not a federally recognized tribe. The North Fork Rancheria of Mono Indians is the federally recognized tribe in North Fork and their Chairperson is Elaine Fink. Also in the area are the Cold Springs Rancheria of Mono Indians, Chairman carole bill and the Big Sandy Rancheria of Mono Indians, Chairperson Elizabeth Kipp, in which both are also federally recognized tribes. Ceremonies are performed at the Sierra Mono Museum in North Fork, California, and an annual Indian Fair Days festival takes place on the first weekend of August every year to revive many traditions and rituals for tribal kin and tourists alike to enjoy. The Mono are divided into the Eastern Mono and the Western Mono, roughly based on the Sierra crest. The Eastern Mono are also known as the Owens Valley Paiute. The Western Mono traditionally lived in the south-central Sierra Nevada foothills. Owens Valley Paiute live on the California-Nevada border, near the Owens River on the eastern side of the southern Sierra Nevada in the Owens Valley and speak the Mono language. Their self-designation is Numa, meaning "People" or Nün‘wa Paya Hup Ca’a‘ Otuu’mu—"Coyote's children living in the water ditch". The Mono speak the Mono language, which is in the Numic branch of the Uto-Aztecan language family. The native language of the Mono people is referred to as "Nim." Mun a hoo e boso. Mun a hoo e num. Mun a hoo to e hun noh pa teh can be translated as "Hello to my friends. Hello to the Mono people. Hello to the people from all over." Estimates for the pre-contact populations of most native groups in California have varied substantially. (See Population of Native California.) Alfred L. Kroeber (1925:883) suggested that the 1770 population of the Mono was 4,000. Sherburne F. Cook (1976:192) set the population of the Western Mono alone at about 1,800. Kroeber reported the population of the Mono in 1910 as 1,500. Today, there are approximately 2,300 enrolled Mono Indians. The Cold Springs Mono have 275 tribal members. The Northfork Mono's enrollment is 1,800, making them one of California's largest native tribes. The Big Sandy Mono have about 495 members. The Big Pine Band has 462 tribal members, but it is difficult to determine how many of these are Mono. ^ Sprague, Marguerite (2003). "Welcome to Bodie". Bodie's Gold. Reno, Nevada: University of Nevada Press. pp. 3, 205. ISBN 0-87417-628-X. ^ Liljeblad & Fowler 1978, p. 412. ^ Pritzker 2000, p. 227. ^ Liljeblad & Fowler 1978, p. 413. ^ Pritzker 2000, pp. 229-230. Wikimedia Commons has media related to Mono tribe. This page was last edited on 11 April 2018, at 12:45 (UTC).